I thought I would share a little of what I learned at recent conference in Washington DC called Beyond BYU, and what I have learned since from some additional research. BYU helped me attend a conference for three days in DC last week. I attended a few of the meetings with individuals who worked on the Romney campaign. They explained some of the things that the Obama campaign did that made a major difference in how effective the campaign was in mobilizing individuals and targeting campaign resources. I interned with the Utah’s GOP during the 2012 Presidential Campaign. Specifically, I helped with the Romney campaign in Utah. I worked at a phone bank in Orem, and we helped organizing the deployment of volunteers to Nevada and Colorado. I have been curious to better understand how everything happened in the end. As the saying goes, hindsight is twenty-twenty. One of the major lessons gleaned by the Republicans is that Democrats dominated in the area of big data, number crunching of massive amounts of information. In a fascinating article by The Atlantic it is explained how a elite cadre of tech experts got together to create the top of the line campaign software and network infrastructure. Additionally, the Obama field organization was larger and more organized than that of the Republicans. As a little background, social sciences, especially academics, are increasingly turning to econometrics — basically statistics — to understand large-scale social behavior. First, someone has to try to collect the data, then someone has to process the data through the right software to determine patterns and correlation, and then someone has to try to create reasonable theories as to when there is causation and not simply correlation. An example, someone records when a rooster crows, analyzing the data shows that it correlates with sunrise, and someone concludes that the sun rises in anticipation of the rooster crowing. Just kidding, obviously the rooster crows because of the sunrise. If a campaign has a sufficient survey and field operations to collect large amounts of data they can focus their efforts on where they feel it will be most effective. One clever thing that the Obama campaign did was to establish as many barbershop, congregation, black business, precinct, and civic organization captains as they could. They tried to register as many individuals within their sphere of influence as they could, and then they left them alone. They didn’t annoy them with a ton of calls or request to volunteer or to donate. Instead they waited until shortly before the election to make the election seem like it was all about an issue that was important to them without giving the Romney campaign enough time to respond. For example, for many months contraception was a non-issue. Then, two weeks before election day a reporter asked Romney a question about contraception. In a way it didn’t matter very much how Romney would respond. The Obama campaign communicated to college age women the idea that Romney was against contraceptives for women, and issue that mattered to them. They may not have followed campaign throughout the previous six months. However, suddenly they felt that the election was all about their issue, whether the fully understood the two sides or not. In 2008, the Obama campaign took data-based voter targeting to a previously unseen level, as Sasha Issenberg details in his new book. 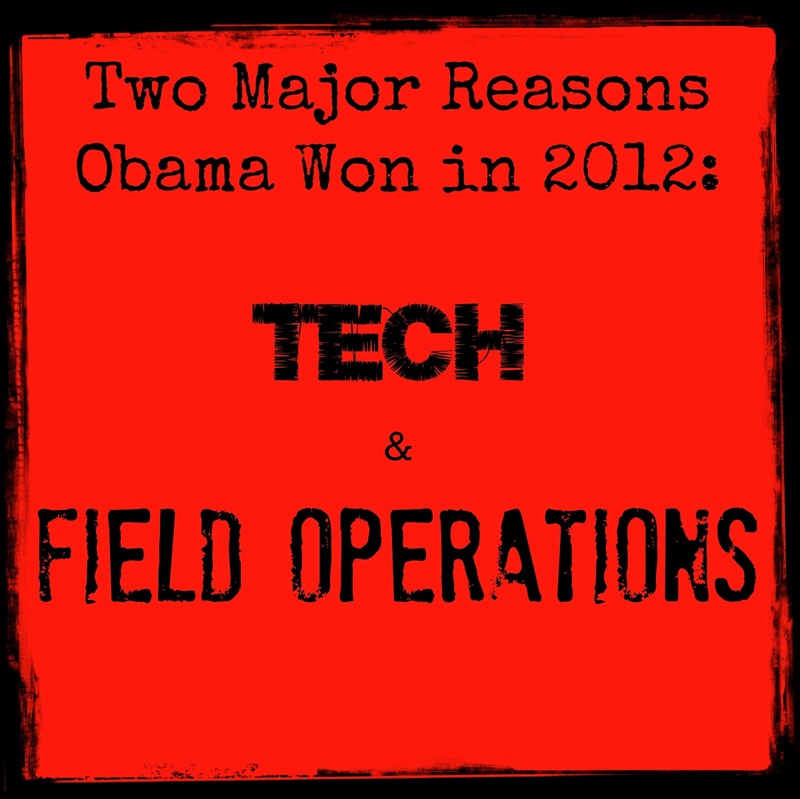 In 2012, they’ve far surpassed those techniques, in part by integrating field techniques with digital operations. I think this is a bit ironic since a lot of the support of the Occupy Wall Street movement came from the left. Anti-big business and pro-government regulation were the major tenants of the movement. Historically, Democratic unions were very involved in protests in some areas. Yet, some of the elite players in big businesses were the ones who made a significant difference in getting Obama elected. In summary, the Obama campaign used tech and a large, sophisticated field operation to turn out lower propensity voters in key battleground states. Now is the time for Republicans to catch-up. According to the Huffington Post that is what they are doing. For me, it can’t happen soon enough.